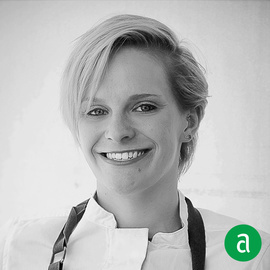 Jessica Nowicki, Chef de Cuisine at Safta in Denver, CO, shares her career timeline and words of advice for up-and-coming professionals. The top things I look for in a candidate are a clean person and an open mind. We want to have good people who respect each other and respect the food. I’m open to hiring people with limited experience – of course, you need to have some restaurant experience, possess knife skills, be organized and detail-oriented; but being passionate about the cuisine we are doing is also important. I couldn’t do this job without my support system: whether it’s my partner, my family or my colleagues, we all support each other constantly. At Pomegranate Hospitality, we want to empower people and help them hit their career goals. Longevity for our employees is highly important, we want people to be happy when they come to work. We treat everyone equally and value everyone's opinion with open-mindedness. I knew I wanted the job at Safta, so I put everything that I could into it: I prepared a seven course tasting menu with a wine pairing. Whenever you want something, you have to give it your all. Traveling fuels my inspiration. I just went on a three month-long trip to Spain and Portugal. I’ve worked with chefs from different origins (Armenian, Greek) so I carry these influences with me in my cuisine. If you know of any extraordinary food, beverage and hospitality professionals who inspire others through their hard work and leadership, nominate them now! Find your inspiration in the unique career timelines and words of advice these industry leaders have shared. Oops! No results have been found for your selection. Please update your selection to see more Inspirational Career Timelines.